PETALING JAYA: Property developers and consultants from Penang to Johor are generally bullish about the residential property market and do not think there is a bubble. They are of the view that there are two types of buyers, one who is buying out of need and the other out of fear that prices would go up further. The speculative element which was evident a few years ago has dissipated. Real Estate and Housing Developers' Association (Rehda, Penang) chairman Datuk Jerry Chan said: “Buyers have money which they would like to park somewhere. 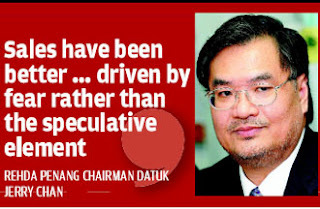 “Sales this year have been better than last year, driven by fear rather than the speculative element,” said Chan who is also group managing director for Penang-based Asas Dunia Bhd. Chan was commenting on a report Debunking the property bubble myth by CIMB which said that talk of a property bubble was overstated as the sharp rise in residential property prices over the past few years was confined to selected areas. “Affordability is near its all-time high and prices have to surge 50% to 100% before affordability falls to pre-Asian financial crisis levels,” the report said. The report said it was surprising that residential prices had not risen at a faster pace as new supply had fallen significantly over the past few years. “So I foresee Penang prices would continue to rise because of inadequate supply of land, not because of inadequate developments,” he said. In the Klang Valley, Reapfield Properties Sdn Bhd chief executive officer Gerard Kho said domestic demand for residentials was expected to be strong until the middle of this year. Managing director for the Khong & Jaffar group of companies Elvin Fernandez said “it is not a question of whether there is a bubble or not but whether prices in certain areas are tied in to fundamentals or not. “And we know in certain hot spots, they are not,” Fernandez said. 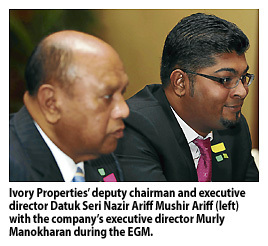 In Johor, KGV International Property Consultants Samuel Tan said the state was undergoing a transition because of the Iskandar Malaysia factor. “New houses entering the market are priced a lot higher than three years ago but the market is accepting it,” he said. KUALA LUMPUR: Takaful Malaysia Bhd is looking at diversifying its investment portfolio by acquiring properties in London this year. Group managing director Datuk Hassan Kamil said the Islamic insurer has RM200 million in its war chest. "We are scouting for commercial buildings or offices within a 30km radius of central London," Hassan told Business Times recently. It is learnt that the company has appointed an adviser to search for properties by the end of this month. He viewed that a depreciated currency and a devalued market were making London properties a worthy investment. "It is a good time for investments, both for potential capital gains as well as reaping good yields," he said. Hassan believed that yields of between 5.5 per cent and 8.5 per cent could be achieved in London's main office and financial district, where demand was hit hard due to the credit crunch. He said if successful, Takaful Malaysia would be the first fully-owned Malaysian insurer or takaful player to own properties overseas. Bank Negara Malaysia limits local insurers to invest up to only five per cent of their total assets overseas. This means that Takaful Malaysia will have about RM250 million for property investment overseas from the total RM4.9 billion investment assets. Hassan hoped that any potential London investments would be the beginning of its plans to broaden income through properties. More than 50 per cent of Takaful Malaysia's asset allocation is in sukuk and equity while Government Investment Issue (GII) and properties are its other main assets. Properties investment currently makes up about five per cent of the company's investment portfolio. Its largest investment is its headquarters - Dataran Kewangan Darul Takaful building, which it bought in 2005 for RM117.7 million.